Digital Project Reflection for Ending the Civil War in April 1865. After creating a “blogcast” commemorating the last month of the Civil War for this course, I must admit it is one of my proudest achievements—at least from grad school. I planned to drop posts on at least 4 dates that correspond to significant historical happenings, The timing worked out perfectly so that I was able to reference other sesquicentennial events, and it landed in the last half of this semester. It was seemingly meant to be. The sound recording process was not as difficult as I thought it was going to be, and I rather enjoyed it. I now have a basic proficiency in Audacity, and know how to upload to Soundcloud and then post onto WordPress. 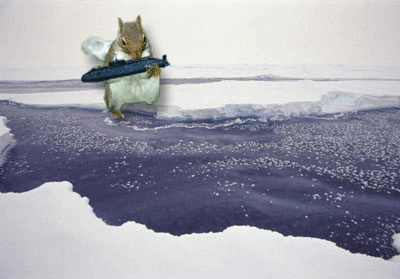 I have included a link to my blog on my resume now as well. In that way, this class has contributed to my skill set ways I had originally desired. Design revisions were being considered, but ultimately I like how the general design is bold and simple with the colors highlighting what should be highlighted. The external sites I posted to stood out well and complemented by project with secondary and primary material from the National Park Service, the Library of Congress, and the Civil War Trust. In a somewhat unexpected outcome, co-workers and friends have taken time to tell me how much Civil War history means to them or their family. I have heard stories and made deeper connections with people by creating and disseminating this digital project. So, that’s awesome, too. Well, my digital project experience immediately brings to mind Matthew Kirschenbaum’s question from back in Week 5: How do we know when we’re done with our project? (cue the laugh track) In my case, my website is more done than it was two weeks ago, and a lot less done than I want it to be, but also it may never really be “done” as my intent is to keep working on it long after our class is officially finished. But here we are at the end of the semester, so for the moment at least, it’s done, and it’s time to take a step back and assess what I did and what I learned from it all. In looking back at my proposal, I definitely had ideas about what I wanted to have as features of my website. I wanted an interactive map so that I could geo-locate as much of the content as possible. I am a photo nerd, so I wanted to have a lot of photographs, but I also wanted the capability at least to also include other relevant items such as oral history recordings, video, and text documents too. I definitely wanted to be able to organize these photos, videos, and whatnots into thematic collections or exhibits, and although I didn’t mention this in my proposal, I wanted to do an interactive timeline as well. And in the spirit of trying to embrace the power of the crowd, which I think this class has definitely opened me up to a little bit, I thought there should be a way in which visitors could engage with the site content by having the ability to add comments and possibly even content such as their own photos. While by no means perfect, I do think that I have been able to successfully incorporate all of these elements into my site. And even though the look of it is not quite what I envisioned—the blue parts were supposed to be black and gray; I was *not* going for red, white, and blue—it’s growing on me and I generally like the layout. A word to the wise to future students of this class—in my experience, it’s really important to narrow your focus as much as you can and to have a good plan to get something limited and doable to “done.” Even with a small project, it’s going to require a lot more time and effort than whatever you envision, even if everything goes right for you. I originally thought my topic was pretty narrow, but then I came up with a longish list of subtopics that “should” be on the site. What I should have done was stuck to what I see as the five most important areas (which if you look on the key of my google map, you’ll see they’re on their own layer)—the Sub Base and Electric Boat are most important, followed by the NAUTILUS memorial, the World War II Submarine Veterans Memorial, and in my mind anyway, the Submarine Capital of the World sign. Also possibly the USS GROTON. I have apparently reached the end of the Internet. Again, for the purposes of getting “done” during the semester, I think it also helps to work on something local to you where you physically are. I had to cram all of my archive research into three days over spring break, and I lost another hour or two upon discovering that my older scanner did not work with my newer Windows 8 computer, so I had to run to Staples to buy a whole new scanner. Whoops. Because of the time crunch, I only got to work at the Submarine Force Library and didn’t get to contact the town historian at all or see what he has in his extensive collection of town history that he donated to the public library. I really wish I could’ve gone back to do more research and also that I could have done that work at a less-than-frenetic pace, but there was just no way I could get back up to Connecticut during the work week this semester. Perhaps my biggest takeaway from this is that things are going to go wrong, or shall we say won’t go as you’d hoped or expected, even when you think you know what you’re doing. After one false start using Omeka, I decided I’d be better off using the familiar enough to me WordPress to create my site. Which turned out to be not quite as easy as I thought it was going to be. I started with a free site, which was fine until I discovered that my embedded content and a widget I wanted to use weren’t working. So then I bought a domain and had my friend set it up on his server, where I have an old WP site too. There I ran into problems with my theme (not easily obtained for free-standing site, and when you do get it installed, the customization options are different than they are on wordpress.com). Then I got my embeds to work and found a new plug in to do what I wanted the widget to do, but standalone images absolutely refused to upload to the site. Gah! The whole project would have been a complete disaster had my friend Patrick not been able to find a workaround for that issue. Ah, technology…. I’m not exactly breaking any new ground with my website here; it is ultimately a curated collection of images with some history thrown in. But I was hoping at least to present the images in a somewhat different way, and as such, I did enjoy using some new to me digital tools, some of which were easier than others to implement. Google my maps (sorry, the embed didn’t work in this site either) looks a little clunky to me, but it was pretty easy to set up, and it works well enough for what I wanted it to do. I was not able to put HTML into the text box so no images or hyperlinks there, but that was not a fatal flaw. Also some topics, like the USS GROTON, don’t necessarily lend themselves to being situated on the map. The town currently is trying to obtain some pieces of the dismantled submarine though, so maybe there will be another sub site on the map in a few years. I set up a flickr photo group (very easy) to allow people to share content and participate in the site without in my mind losing control over the endeavor. I think it will be a very cool participatory feature once I get people to start submitting their own images, and I can start inviting people to do so with a simple search and a couple clicks of the mouse. 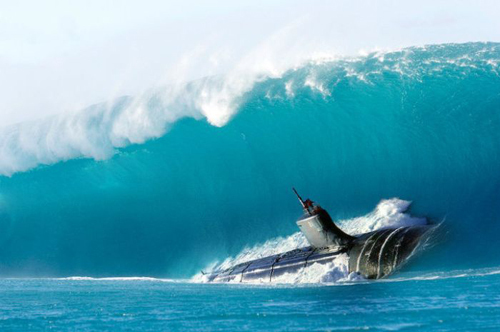 My hope is that the group eventually would provide some different photographic takes on the relationships between the subs and the submariners and the rest of the town that aren’t the standard subjects or perspectives and that probably would not have occurred to me. I do recommend testing out any new tools that you intend to use very early on so that when it’s really go time, you have a good idea of what to expect or you have already found a suitable alternative if something isn’t working the way you want it to. As I mentioned, I had intended to go with Omeka rather than WordPress to design the site, and I started using it I thought early enough, but after playing with it for a bit, I just didn’t feel like I had the time to invest in getting to understand the platform well enough to be able to wrestle my vision into their framework in the way that I wanted to. I am disappointed in my site and myself, because it is so not close to what my vision of “done for now anyway” is, never mind “wow, this is really cool and there’s so much there!” There are so many little things that I wanted to work in somehow, and, well, Electric Boat, which is a pretty major piece of the story, is really not done and the Sub Base could use some additional post-World War II coverage. But having said that, I do like what I have gotten done and I’m looking forward to continuing to work on this further, at a much more relaxed and thoughtful pace, so that I can really do a good job with it moving forward. Once I’m in a bit better shape with this, I also need to start soliciting the opinions of other people, including those who I mentioned in my proposal, and invite people to share their images with the flickr group because my not very exciting photos are getting lonely in there (I really need to take some new photos next time I’m home). The really cool thing about this project for me though is that I feel more connected with my hometown now. I lived in Groton for 24 years while many of the events that I mention took place, yet the only submarine-related event that I recall attending was the christening of the USS COLUMBIA in 1995 (historic! Which I’ll have to write about on the site at some point!). Now when I go home and see a sub on the river, I squee like a little kid. From reading local history books for this project, I learned a lot about Groton history beyond submarines, the Navy, and shipbuilding, but I just don’t feel a strong connection with, say, Groton’s colonial past like I do with the submarines, possibly because my family had no connection to the area prior to World War II. To me, the submarines and the people, places, and events connected to them are what make Groton truly unique from every other old New England town, or from anyplace else in the country really, and I’m looking forward to sharing more of that distinctiveness on the website in the coming months. The hundredth anniversary of the first subs arriving to be stationed in Groton is less than six months away, and the centennial of the base’s official designation as a submarine base is just over a year off. So what I’m saying is, this web site really needs to be “done” fairly soon. Moving from Little Rock, Arkansas to the Washington, D.C. area this fall was bittersweet, because as excited as I was to start my graduate career, I had to put my museum work on hold temporarily and leave a position where I was involved with many ongoing projects and programs. This semester, I had the pleasure of taking a seed of an idea that was born at my job in Little Rock and growing it into a real project that has great potential for growth and audience outreach. 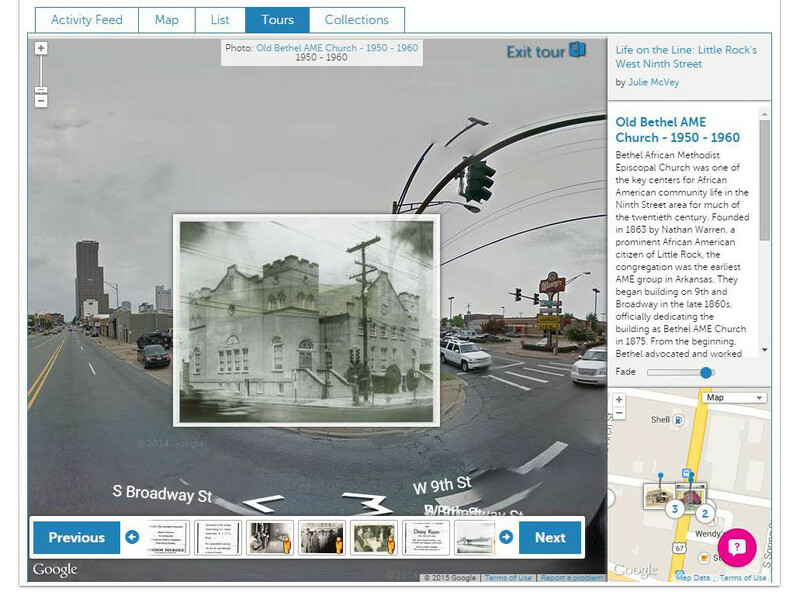 By using Historypin to create a photo tour of Historic West Ninth Street, I was able to apply skills learned in the Digital Public History class to an ongoing effort of public historians at the Mosaic Templars Cultural Center to engage the Little Rock community in the city’s African American history. It’s always satisfying to use the things we learn in school to accomplish real goals, especially for this project, as I know many people who are deeply passionate about preserving and educating others about Arkansas black history. 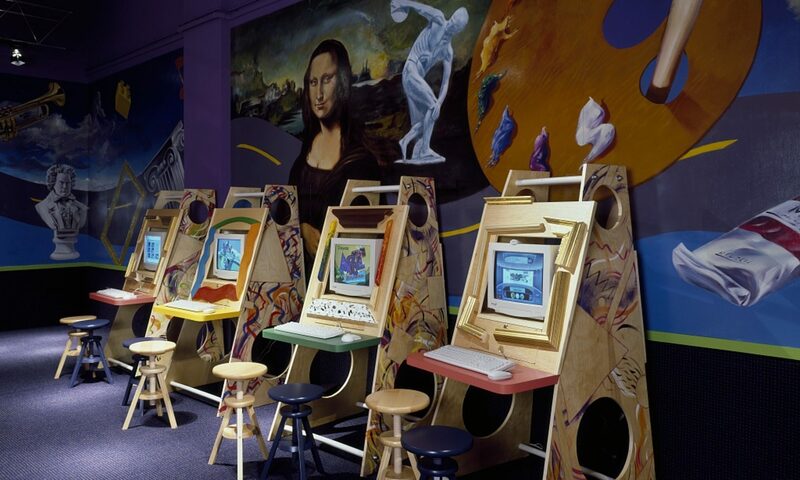 The original dream for the project was something very similar to the Museum of London’s Streetmuseum app, which allows users to hold their smartphone up to a particular location and see a historical image directly imposed on the space. However, something like Streetmuseum would cost many thousands of dollars that most smaller museums don’t have, so I was incredibly happy to learn about Historypin, a great (and free!) alternative that would allow for a similar experience. Using Historypin ended up being even more ideal, I think, because of the crowdsourcing element available through the platform. Overall, I’m very pleased with how the tour of Historic West Ninth Street turned out. I ran into a few issues, mainly that Google Maps doesn’t have exact street addresses for businesses and buildings that don’t exist anymore. I particularly ran into a dilemma as to include images of places that were demolished to make way for the Interstate highway, as placing an image on a tour where people can’t actually go deviated from the original purpose of having users actually walk down in the Ninth Street area. I decided to go ahead and include them, as they emphasize how drastically this historically black district was changed by urban renewal and the expanded highway system. Also, I’m hoping that as I begin advertising the tour, users who were familiar with the area can help with more precisely locating the images of old businesses and other various buildings. I’m excited to keep working on this project over the summer, getting the word out about it through working with Mosaic Templars Cultural Center and other cultural heritage institutions in Arkansas. Partnering with the Pop Up West Ninth Street entrepreneurial program will be especially productive, as Pop Up focuses on getting people to physically come down to the area. Getting the community involved in a key part of the project, as it has great potential to act as a collaborative tool between individuals and cultural heritage professionals and institutions. 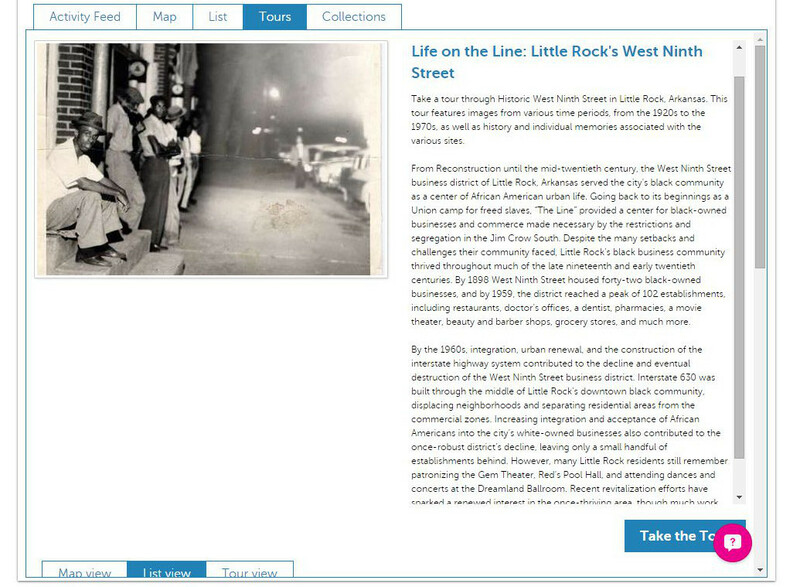 Long term, I hope to possibly work with the Historypin team to create a larger project that will include collaboration with people from across the state to pin images, tell stories, and document Arkansas’s African American history in a centralized location. 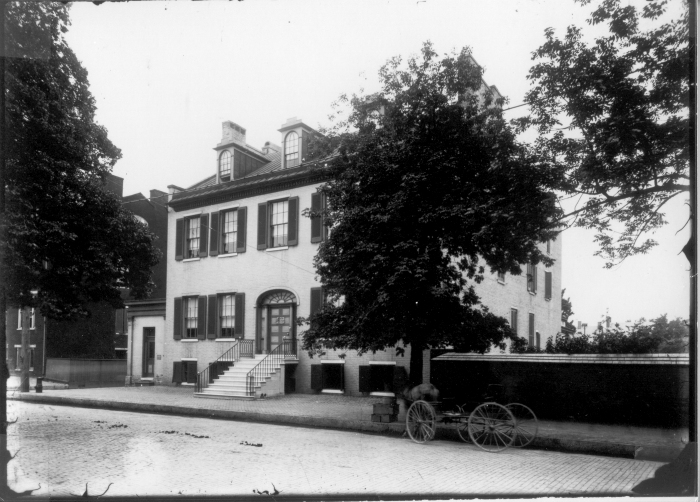 For my digital project I decided to create a WordPress site for the Archives and Research Center of the Historical Society of Frederick County (HSFC). The site offers information about the Archives and Research Center, its collections, new donations, and will host collection finding aids as they are completed and verified against the actual collection contents. I am the Research Center Coordinator for the Historical Society and I received approval from my Executive Director to proceed with the blog. Loat’s Female Orphan Asylum, now home to the HSFC. I plan to post blog entries regularly based on new projects, items “found” in the collection, new accessions and my work schedule. My goal is to write and share longer blog posts every two weeks and shorter “item of the week” posts every week. My original plan was to create a catablog for the Archives and Research Center featuring a collection guide for the William O. Lee Jr. Collection, collection MS0080 of the HSFC’s Archives and Research Center. I had planned to use Omeka to display the collection’s finding aid and exhibit some collection items. The Lee Collection is the HSFC’s only collection documenting lives of African Americans in Frederick County. It was my hope to share this valuable collection and generate interest in the archival collections of the Historical Society. I decided to switch to WordPress because the platform would allow me to post my finding aids as static “pages” and submit regular blog posts. The Lee Collection was the first finding aid I posted but I wanted to broaden my focus to include as many finding aids as possible. When I finished posting the four finished finding aids up currently, the site still felt flat. Sharing information about the Research Center through a blog seemed like a more effective way to reach out to HSFC members, potential members, and members of the wider community. Every week at work I “discover” new things in the HSFC collections and I felt that regular blog posts would be an excellent way to connect with the public. 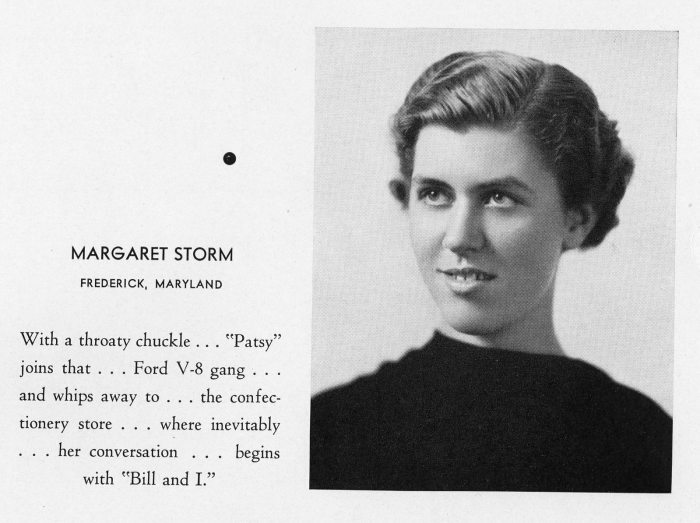 My first blog post was inspired by the photograph collection of Margaret “Patsy” Culler Storm Moore. She was a life-long resident of Frederick and had a passion for photography. Margaret Culler Storm Moore, in the 1938 Touchstone yearbook of Hood College. 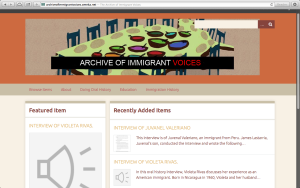 For my project I created the Archive of Immigrant Voices using Omeka. Created in 2012 by the Center for the History of the New America (a history department center for which I am one of two graduate assistants), the Archive has remained largely undeveloped. Currently, the Center owns ten oral histories, all conducted as part of an undergraduate final project for the UMD course HIST428N Immigrant Life Stories: An Oral History Practicum (held Spring 2014 and sponsored by the Center—more of these from an additional class are forthcoming), yet only one was uploaded to the Archive. 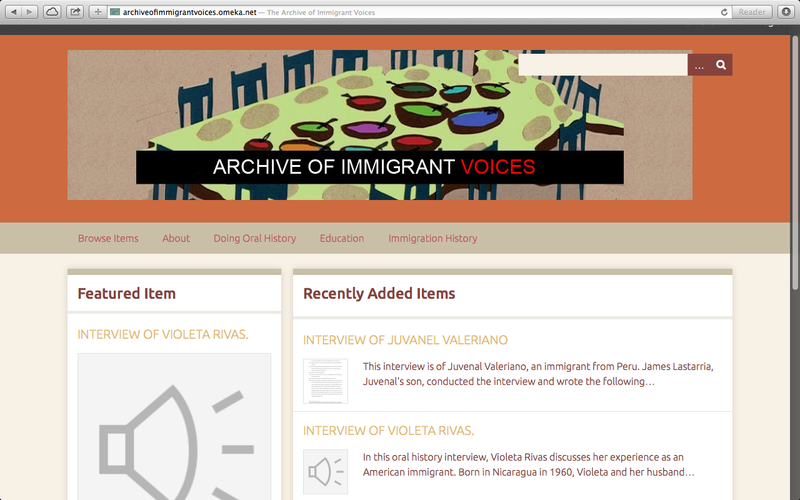 After creating the new Archive page on Omeka, my initial plan was to upload all ten of the oral histories (with tags, metadata, and transcripts), create an about page, an education page (including one lesson plan), and pages on conducting oral history and immigration history. All four of these pages and a sample lesson plan were created. Only five oral histories, however, are currently included in the Archive. The education and immigration history pages were of particular importance to my supervisor, executive director of the Center, Dr. Katarina Keane. I brainstormed many ideas with Dr. Keane about what kinds of resources and information we wanted to include on the site in order to effectively convey the place of the Archive within the mission of the Center, and highlight the importance of contemporary immigration history. In order to meet these goals, we settled on offering on the immigration history page a basic background overview of the significance of post-1965 immigration and the role of the Archive in sharing individual stories of contemporary immigration. Within this page, I also chose to include additional information and web links on immigration history, other immigration centers and programs, and a recommended bibliography. The choice was made to include links and information like this so that users could investigate immigration/migration history further without being overwhelmed by a long historical narrative. On the education page I decided to provide an overview of the education mission of the Center, and the ways in which the Center, and now the Archive, are fulfilling this mission. While contributing to the goals of the Center, the Archive itself is focused particularly on oral history, so I wanted the Archive education page to reflect that. Because of this I chose to include links for educators to other immigration/migration oral history projects and lesson plans, and information on the Archive’s plans for future education resources along with a sample lesson plan that includes objectives aligned with C3 standards. The oral histories themselves were the most challenging—and surprisingly time-consuming—aspect of this project. While I originally hoped to upload all ten of the interviews, space constraints within the webpage, along with incomplete metadata information, prevented me from doing this. In the end, I have currently uploaded five interviews. I included tags and metadata for all five of these. They are all, however, in different formats, and some do not have transcriptions. Others that I chose to not upload were video interviews (requiring more space) and/or did not include any metadata. Throughout the process, Dr. Keane, my fellow graduate assistant, and other graduate students in the history department, used the website and offered advice on how to improve layout and content. From these comments, I worked to simplify titles of pages, rearrange content, and edit down wordy background information. I was unable, however, to do any user testing of the website and lesson plan with educators. At a Smithsonian-led interdisciplinary meeting on education a few weeks ago (for a different project I am working on for the Center) I was able to speak with multiple public school K-12 educators and administrators on the particulars of effective lesson plans and resources. Dr. Kathy Swan, associate professor of social studies at the University of Kentucky and co-author of the newest version of the College, Career, and Civic Life (C3) Framework for Social Studies State Standards, spoke with me at length about what educators actually need/want in lesson plans and resources from cultural institutions, subject experts, etc. She adamantly argued that these kinds of educational tools should provide teachers a framework for instruction and incorporate content in different ways, but they do not have to align directly with state or national standards. The teachers themselves should be able to do this, she argued. Because of this, I edited my lesson plan to also include objectives not explicitly aligned with standards, but instead highlighting the specific content within the chosen oral history and larger questions about immigration and migration. Dr. Swan also explained that the C3 stresses inquiry and critical thinking as the most important social studies skills for K-12 education. Because of these, I worked to make sure that these overarching skills were present throughout the lesson plan and will serve as central ideas governing further educational resources created by the Center. Moving forward, I plan to work with Dr. Keane and Prof. Castillo on collecting further metadata for the rest of the interviews, as well as alter the size of files to improve access. Compressing the audio/video files to much smaller mp3 files will standardize the formats and allow for additional interviews to be uploaded. Dr. Keane and I have also discussed paying for additional space and plugins from Omeka in order to accommodate more interviews and allow users to contribute their own oral histories. I also hope to create additional lesson plans for other grade levels and engage public school teachers, and undergraduate professors in user testing. More feedback from users on the oral histories themselves (exploring them, listening, contributing interviews, etc.) will also be helpful in improving the Archive as it grows.